Suwa Grand Shrine Kamisya Maemiya (諏訪大社上社前宮) is one of four Shrines of Suwa. It is located south of Kamisya Honmiya. Maemiya literary means pre or farmer shrine. Suwa Shrine was originally located in this place. Therefore, it is the birth place of the faith in Suwa. There is a sacred pure water, called "Suiga," for ritual hand washing. 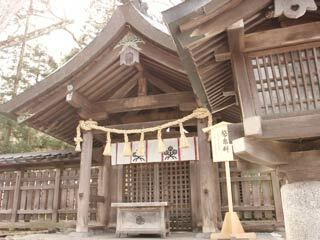 The current shrine is made of used wood of Ise Jingu. ... is the ruins of original Suwa Shrine, and the first place where the god of Suwa appeared. ... is located right side of Torii Gate. It used to hold the sacred mirror of Suwa. Current shrine was built in Showa, but it used the woods of previous shrine which built in Sengoku period. ... is the platform for ritual events.